Hair Extensions are attached to the hair to create extra length & fullness. At Hype Hair Studio we offer Clip In or Permanent Hair Extensions. Hype use 100% Euro & Remy Human Hair Extensions. Our services include colour matching, blending, personalized cutting, styling & removal. 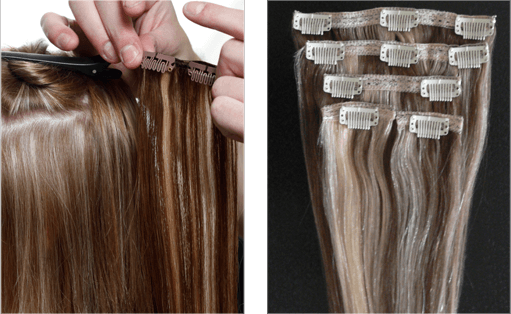 At Hype, we offer double weft Clip In Hair Extensions. This means double the thickness! Each set contains separate pieces in different sizes. Our Clip In Hair Extensions in Melbourne are available in a range of colours & are easy to clip in, totally changing the way you look in no time. Each weft has Comb Clips sewn across the top. These clips are extremely strong, allowing the Extensions to grip to the hair firmly & secure. At Hype Hair Studio, we stock a wide range of Clip In Hair Extensions, so there is no need to wait. Just come in and have our friendly team assist you with your purchase. Our technicians use the Resin Bonding System. This is the finest method because our stylist are able to apply various thicknesses to the hair wear needed, which allows us to personalize & transform your hair to look 100% natural. The resin has been specially formulated to ensure that no damage is caused to your hair & is easy to remove, leaving no trace of residue. Maintenance is an important factor to extend the life span of your Hair Extensions. We recommend allowing a little extra time each day to care for your new hair. The following information will help you with your new Hair Extensions. While shampooing your hair avoid circular motions as it may cause the hair to tangle. Instead gently, using your finger tips, stroke from the top of the hair down. Rinse thoroughly. Pay particular attention to the conditioning of your hair. Your will require a good amount of conditioner, as your nature hair oils do not pass the bond to your Hair Extensions. Rinse thoroughly. Always pat dry with a towel; do not use vigorous motions, as this will cause your hair to tangle. When your hair is no longer dripping wet, you may use your fingers to separate your hair & apply a leave in moisturizer. When using a dryer, do not apply direct heat to your bonds as this may cause the bond to soften. Hold the hair near the bonds to avoid the Extensions to pull. Start by brushing the hair from your ends & slowly work your way up. Do not use any hard bristle brushes or fine tooth combs. Instead any sort of cushion brush or wide tooth combs will be ok.
Any type of curling & straightening irons are safe to use on your Hair Extensions, do not apply direct heat to your bonds. To prevent your hair from knotting whilst you sleep, we recommended you tie your hair loosely in either a pony-tale or a plat. It is recommended to use a satin pillowcase, to allow your hair to move freely whilst sleeping.